We say a big Congratulation to them all. This week's topic is out and it is: "Educated Illiterate"
1. Submission of ARTICLES in "Article Writing Quest" for Week 2 begins at 7am today 28th July 2014 till 4pm on Thursday , 31st July 2014. 4.The articles should be in MS-Word of not More than 2000 Words on any subject about "Educated Illiterate"
7.You can also follow TheNewsNest (@TheNewsnest) for LIVE feeds of your articles on Twitter. This initiative is aimed at inculcating in our Youth &amp; Students the culture of reading, research & writing skills. 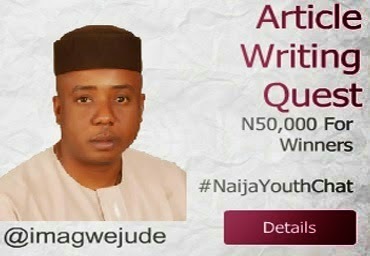 This Weekly competition will therefore give room for the birthing of a new generation of writers & scholars. Nice initiatives. ..Hope to see more of this.